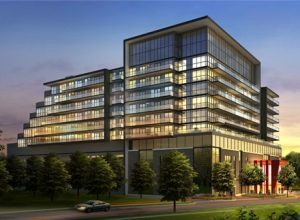 Ion, the new condo project by Cityzen and Fernbrook, is celebrating the release of a one-bedroom plus den this Sunday, July 22. Head over to the sales centre at 1055 Wilson Avenue after 12pm to get in on the new release action. The first ten purchasers to ink a deal on Sunday will receive a free storage locker. If you’re condo hunting in the area around Keele and Wilson Avenue, this is one event you won’t want to miss out on. CHIN Radio will be broadcasting live from the sales centre so this is clearly a big deal! Ion also has a limited time purchaser promotion that could see you receiving up to $12,000 in credit upon closing. You’ll need to swing by the sales centre to learn more about that! To get the full scoop on Ion, check out our news story on its proximity to Canada’s first fully digital hospital and its wide range of suite sizes. For more info on ION call 416 633 2737, email info@cityzen.ca or visit the website.